I refer to the http://quant-econ.net/py/ifp.html and its corresponding solution notebook. I have managed to obtain the invariant asset distribution and the invariant consumption distribution, but I am wondering if it is possible to plot a 3D surface of x=asset, y=consumption, z=density. I wasn’t sure how to even start about going that, so I gave myself an easier task, that is to plot the optimal consumption plan obtained straight from the coleman, Kc. I have seen many different ways of plotting a 3D surface on python (including the one available on quantecons), so I picked one and tried it. Is anyone able to see what is the error here? Also I am keen on the original project/task (and if it is even possible)! If I may just add; the original task should be possible! Since “any deterministic function of a stationary process is stationary” got this from Prof. John and I found an article that managed a 3D plot of invariant asset and income, http://rsta.royalsocietypublishing.org/content/372/2028/20130397#disp-formula-15. Could you please post all your code including import statements, etc.? If your code is getting long you can use a gist like this one. The function f has to be vectorized for meshgrid to work. try f = np.vectorize(f) after the function definition. for the x axis np.arrange(0, 4) returns (0, 1, 2, 3). Is that what you are after? After adding np.vectorize I am still experiencing the same “Object too deep” error; from this error, I can’t really see the nature of the output that the vect. func will give and hence its intuition. The x-axis was tricky for me since I wanted the actual asset values but in the context of extracting c from the f(X,Y), I needed it to be an index as well to access every asset point. Perhaps I could change it to np.arrange(0,50) since there are 50 points in the gridsize, but that would not be what I have described the x-axis to be. Just to be totally clear, your aim is to produce a 3D plot of the stationary distribution of the pair (a_t, c_t) under the optimal policy? 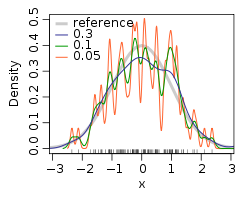 Just to follow up, if you want to plot a density on a continuous state space from simulated observations then you probably want to use a nonparametric kernel density estimator. Thanks. That is an amazing advice. I have since manage to do my original task of a stationary distri of the pair (a_t, c_t) under the optimal policy. I know this is not exactly the question you asked, but since your distribution is defined over a 2d space, you can get good visual feedback by looking at a heatmap with level curves. There is a library that does this fairly well among other things: seaborn (with some bits of kde inside). It looks to me from your plot that the bandwidth could be increased a little bit — this will make the density estimate less spiky — if you are interested please google about choice of bandwidth for nonparametric density estimators and experiment with different values.